Over time, kitchen equipment, walls and floors can become contaminated with greasy buildup. Our steam cleaning process can “deep clean” these areas well beyond what your restaurant staff can accomplish. Using the latest steam cleaning equipment and FDA approved chemicals our crews can return your kitchen back to “eat off the floor” condition. The fire codes adopted in Texas (NFPA 96) require exhaust fans to be hinged, allowing thorough cleaning of the fan and the duct below it. Hinging the exhaust fan is not only required by code, it will also help to significantly increase the life of the fan. Exhaust fans are made of very soft aluminum and can be damaged during the cleaning or repair process just by taking an unhinged fan off and setting it on the roof. Hinging eliminates the need to remove the fan as it can be tilted back to allow complete access to your system. Fans that are not hinged can become out of balance and begin to vibrate and make noise. Electrical wiring is more susceptible to damage in a fan that is not hinged. NFPA 96 requires access panels on duct at every change of direction and every 12 feet of length. These panels allow our technicians to completely clean the system eliminating “if we can’t see it , we can’t clean it” areas of the duct. Exhaust fan clean out ports are also required by code. These ports are mini access panels which allow complete inspection and cleaning of the exhaust fan. Fan access panels (clean out ports) allow our technicians to clean the back side of the fan blades. Not having the clean out ports can result in grease build-up on the blades which can cause the fan to become off-balance, vibrate and noisy. This vibration will prematurely wear out the fan bearings and belts. 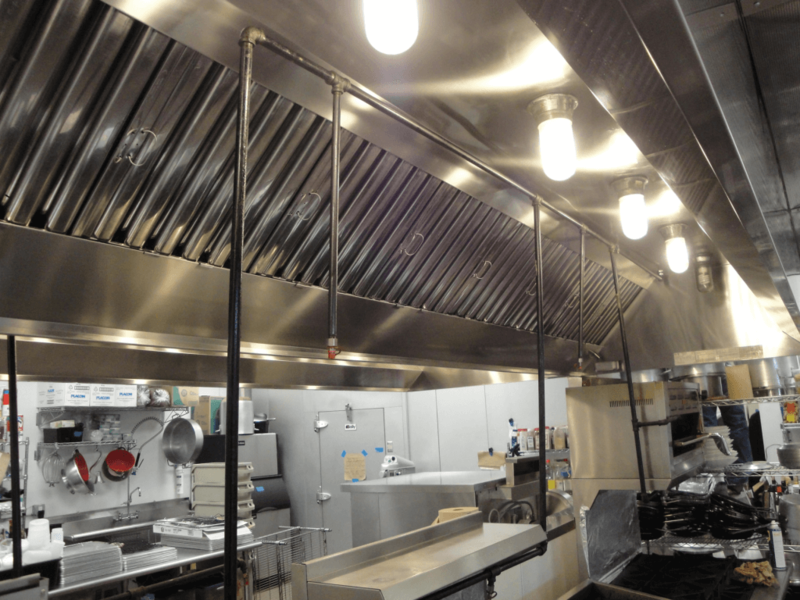 Maintaining and replacing the hood filters in your commercial kitchen exhaust hood is more important than you might think. Hood filters or grease baffle filters are designed to remove the grease laden vapors from the air before they contaminate the exhaust hood ducts. Properly maintained filters are an important line of defense against a grease fire in your restaurant. Cleaning Hood Filters: Hood filters should be cleaned every day to keep them free of grease and maximize their filtering capability. If you have a high temp dishwasher, run your hood filters through the dishwasher. If your filters are aluminum or galvanized we do not recommend cleaning them in the dishwasher. Chemicals used in commercial dishwashers will cause aluminum and galvanized filters to turn color and corrode. Replacing Your Hood Filters: Conduct regular visual inspections of your restaurant’s hood filters. When your filters become dented, corroded or are no longer easy to clean, it’s time to replace them. Pro Hood Cleaning clients can purchase filters directly from us at our cost. We’ll measure, deliver and install the new grease baffle filters free of charge. Because they are the most durable and easily cleaned filters available, we sell only stainless steel hood filters. The best way to prevent grease from damaging your roof is to install rooftop grease containment on all your exhaust fans. Properly designed rooftop grease containment will collect and hold the excess grease from your system while allowing rain water to drain off. An effective rooftop grease containment system will include “hydrophobic” pads designed to shed water but hold onto the grease. Just having a grease box to catch the excess grease from your fan without these pads means the rain water and your grease will spill onto the roof. PRO HOOD CLEANING sells, installs and maintains efficient, cost effective systems designed to protect your roof from expensive repairs caused by rooftop grease. Once installed your rooftop grease containment system will be serviced each time you clean your kitchen exhaust hoods. Proper rooftop grease containment is an inexpensive way to protect your roof. Portable fire extinguishers are the first line of defense. A fully charged and properly maintained fire extinguisher can help minimize damage to your business and injuries to your employees and customers. Inspections and Annual Maintenance keep you protected, and our Certified Partners document each piece of equipment to keep you in compliance. Let us assess your fire safety needs and help you institute the measures that will keep your business and your employees out of harm’s way. 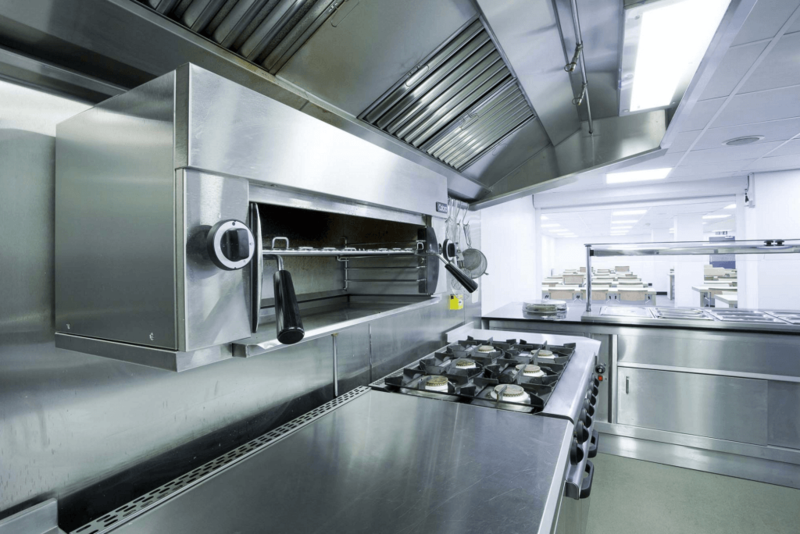 PRO HOOD CLEANING offers kitchen fire suppression installation and service to maintain your system so it acts as it is designed – effectively and reliably and in compliance with the standards. 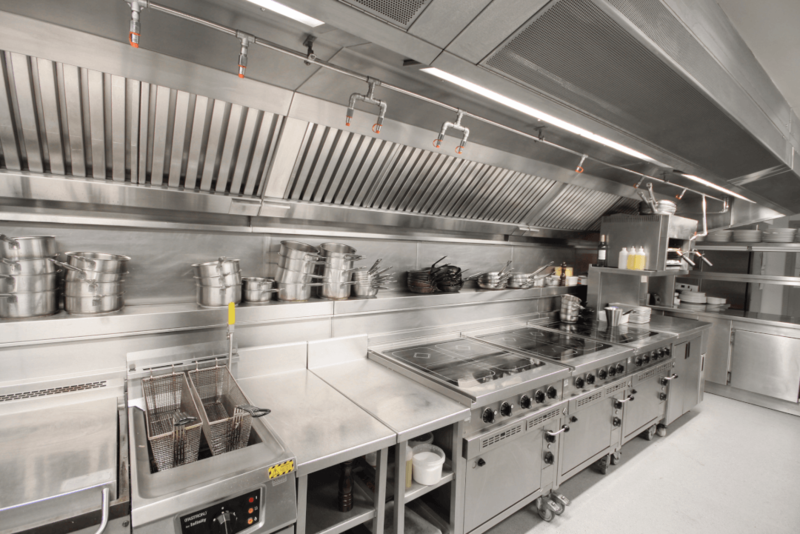 We will design, install and routinely inspect your kitchen fire suppression system. In some cases, conventional fire suppression methods can cause as much or more damage than the fire itself. PRO HOOD CLEANING offers Fire Protection installs and services Special Hazard Suppression systems designed to detect and suppress fires in seconds, so your most indispensable resources are safe from fire, smoke and water damage. PRO HOOD CLEANING proudly services Central Texas for commercial kitchen cleaning and is fully insured, bonded, certified and licensed.